Shopping for Star Wars Prop Replicas? Wield the power of the Jedi! Rey's blue lightsaber from Star Wars: The Last Jedi. Features a metal hilt and a clear display stand for ultimate collectability. Wield the power of the Jedi with this Rey (Jedi Training) Force FX Lightsaber from Star Wars The Black Series. 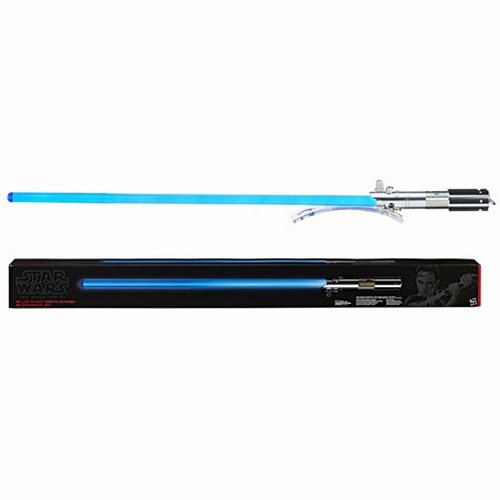 Modeled after Rey’s lightsaber in Star Wars: The Last Jedi, it's a true-to-story, authentically designed replica of Rey's blue lightsaber, complemented by a real metal hilt and a clear display stand for ultimate collectability. The Star Wars The Black Series Rey Force FX Lightsaber requires 3x 1.5v "AA" batteries, not included. Ages 18 and up.